Decor – Centerpoint Manufacturing Inc. The Décor line offers decorative stainless steel patterns. Painted galvanized metal surface beneath the metal are also coated with a water-based Sherwin-Williams® urethane paint. 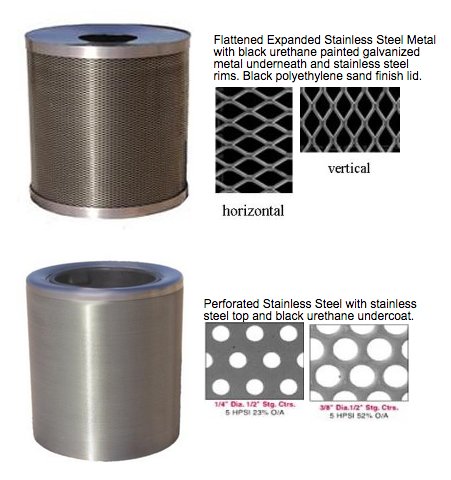 Choice of galvanized metal top or stainless steel top. The undercoat and metal may be painted any Sherwin-Williams Exterior color. Available in 30, 35 or 40 gallon sizes. Available in all force protection levels. 30 gallon: 29-3/4” OD x 32” tall. 35/40 gallon: 31-3/4” OD x 38” tall. Height is adjustable up to 1.5” when feet are extended. Weight: depends on force protection selected—720 pounds to 1,950 pounds.